The mapping department creates new property accounts by working through filed deeds, plotting field notes, and editing plat maps. The process begins when a notarized deed or document is filed with County Clerk's Office. Once the clerk's office has filed and stamped the document, the appraisal district will obtain a copy from either the owner or clerk's office. Once the document is obtained,the mapping department begins working through each document. They first begin by plotting the surveyor's field notes, then use the field notes and legal description to determine where the tract is located. Once this is done, the paperwork to create the account begins. The Mapping department creates new legal descriptions and account numbers for each new owner and tract of land. When the plotting and paperwork is completed it is then sent to the Data Entry department to be checked and keyed. At this point the account/ tract creation process is complete. 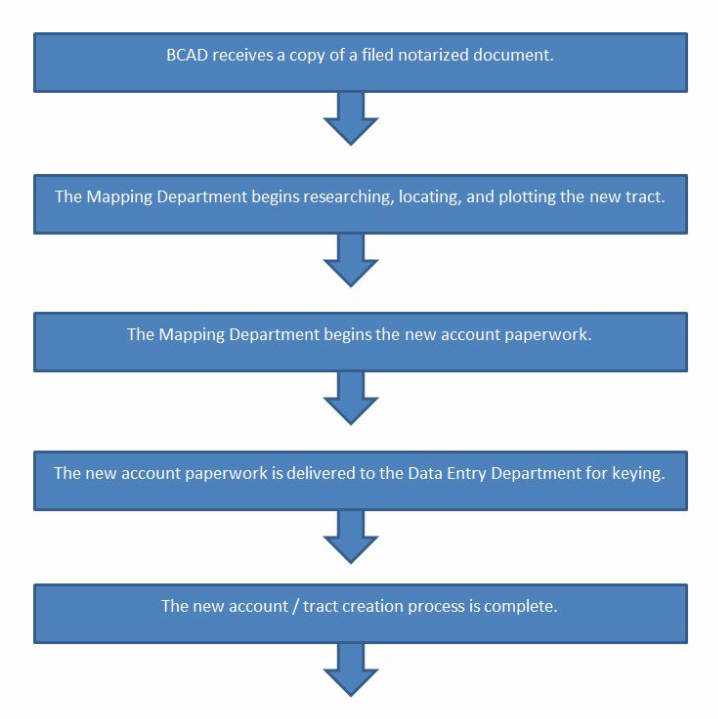 Below is the order for the account/tract creation process. Our Goal - From the moment we receive your recorded document, our goal is to complete the entire account/ tract creation process in 30 to 90 days and not to exceed 180 days.